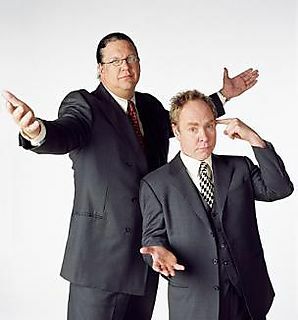 Penn & Teller is a double act consisting of Penn Jillette and Teller. The duo's act is an amalgam of illusion and comedy. Penn is a raconteur and Teller generally uses mime while performing, although his voice can occasionally be heard throughout their performance. They specialize in gory tricks, exposing frauds, and performing clever pranks, and have become associated with Las Vegas, atheism, scientific skepticism, and libertarianism.